Discussion in 'Subwoofers' started by tribz, Mar 4, 2013. First of all, hello and apologies if this is a recurrent question here. I have read the sticky honest. I've just added a subwoofer to my system and it does nothing but hum. Cant seem to get any audio out if it all. My receiver is a Denon 1513 and the woofer is yamaha YST-FSW050 and everythings connected as per this. With the sub lead disconnected theres no hum so I dont think the woofer is faulty, it just hums as soon as its connected to the denon. 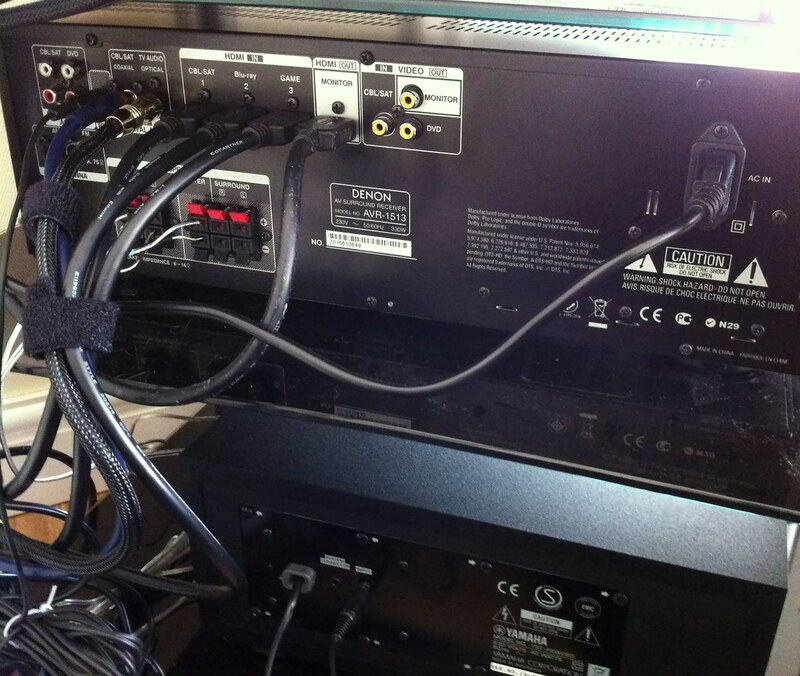 I've removed all the cables in the back of the denon and the hum remains, however when I unplug the HDMI out the hum then raises its pitch to a higher level. Everythings plugged into one strip but I've tried moving things onto their own sockets. I've tried a ground loop isolator and it didnt work, it made a small difference but the hum is still extremely noticeable and there is no audio output. Note, I'm clueless with the settings but the speakers are all set as Small and the subwoofer is set to on with LFE+Main in its settings at 120Hz. I've tried playing with these settings to no avail. Try a different cable for the subwoofer. Any old (composite)video cable is fine. It sounds like the cable you are using may have an internal break. Also, be sure to always power off any device before connecting/disconnecting cables/wiring. Power Sound Audio is distributed in the UK via Kalibrate Limited. As above, sounds like you have either a faulty cable, or the cable you have is picking up interference from somewhere. Thanks, I've just tried a composite cable and it does the same thing. :-/ Could it be a faulty sub? Just unplugged everything apart from sub lead and it's doing the same. I've noticed that when I handle the sub lead (both ones tried) that the frequency of the hum changes. I'm wondering could the sub cable be picking up interference as mentioned but what could be causing it? Have you got and step down transformers pluged int like hdmi swicher or something like that 5v/6v. Only thing that's plugged in when I was testing was the receiver and the sub, everything else inc the tv is unplugged. It's only a small house so it could be picking it up from elsewhere. Ill unplug everything in the house and see if its still doing it. I just had this problem the suspect was a kinked rca cable. I have ran many subs over the years and at time would experience nothing to a slight to then a moderate and recently a severe hum. New cable and not a jot. If it was just some background hum that changed as you moved the cable then it could certainly be interference, especially with the nest of wires in the picture. However, that simply wouldn't account for the lack of audio output - you'd expect some hum when nothing was playing but interference wouldn't account for a lack of signal. Since you've tried a different cable then the next step is to see whether the sub can actually play anything at all. You could try finding something else that has an RCA output (maybe the TV) and see whether playing a full signal into the sub gives anything, or whether that hums too. If it reproduces sound then it points to the receiver. I guess you could also see whether taking the sub output from the receiver gives any sound, or hum, when plugged into something with an RCA input. Like a computer speaker or the TV. Epson TW7300, Sapphire 92" screen, Yamaha RX-V779 into Mordaunt Short surrounds, miniDSP active crossovers into tri-amped Yamaha NS1000Ms, BK XXLS400 sub, other boxes with red and even blue LEDs, lots of wires. Bit of progress, I plugged my iPhone into the sub via some adapters and I could play music through it albeit very basy of course but with no hum. At least it proves the sub I think. Edit just tried an RCA speaker in the denon sub socket and got diddly on the speaker tony test through it. Daft question time, does it matter that there's no rears plugged in, just a right left and centre? It shouldn't matter since it is common to use a pair of mains and a sub. I'm leaning towards your Denon having a fault. In the manual there should be a way of resetting it to factory defaults. Might be worth a try. I think I'm leaning towards a fault on the denon also. I'll take it back to Richer Sounds and see if they'll test it for me. If your receiver has a 7.1 analogue "out" put the sub rca in to a few other channels left, right or centre preferred but anyone apart from the lfe channel. If it plays sound without hum you probably have a faulty receiver. If it exhibits the same behaviour and you have plugged the sub in to the wall with no rca connected at all without hum, my guess would be the cable.